If you’re feeling a sense of foreboding, you’re not imagining things. With Mars and Saturn just a couple of degrees from conjunct, a heavy energy is playing out in our lives. Considered by ancient astrologers as malefic, Mars and Saturn conjoin every two years. The last conjunction was at 8 degrees Leo on June 17, 2006. This Thursday, they’ll meet at 5 degrees Virgo. Although this aspect is scary, there is also reason to be optimistic. Saturn limits and constrains, while Mars is about action and movement. Even in Virgo, an earth sign, the Mars force can break down barriers. He may not do it in the most graceful or sensitive way, and the results may be extremely uncomfortable, but at least you won’t be stuck anymore. I like to use the analogy of your foot being asleep after you’ve been sitting still for too long. When you get up and the blood returns, the pain can literally knock you down. But at least you know your foot is still alive. Where you feel this aspect the most depends on where you have 5 degrees Virgo in your chart. For example, if it’s in your seventh house, you’re feeling the pain in a significant relationship. In your sixth house, you may be faced with an obstacle at work, and so forth. The Moon is in Virgo today (July 6), and conjoins both Mars and Saturn. The conflicts you find yourself in today provide clues to what may come about when Mars and Saturn meet on Thursday. The time on the West Coast of the United States will be 11:11 a.m., a significant number in the art of numerology. I’m hoping for a breakthrough in a difficult challenge I’m facing, and I’ve been trying to do the work. Indeed, hard work may be another outcome of this energy. Neith just reported to me that she’s overwhelmed with harvesting and preserving – both very Virgo activities – because weather anomalies have resulted in several crops ripening at once. The rest of the week is fairly tame by comparison. On Wednesday, the Sun opposes Jupiter, who’s retrograde and in his fall in Capricorn. Sun-Jupiter aspects often correspond to overindulgence, but I don’t think that will happen here. If anything, we may be able judge our limits. Knowing your limits can be tricky, and knowing when to push beyond them even more problematic. Early Thursday, Mercury opposes Pluto, providing a rare opportunity to see the deeper truth behind events. At 29 degrees Sagittarius, Pluto is still in a relatively close trine with Mars and Saturn, and once Mercury enters Cancer later in the day, he’ll be approaching a sextile with Mars and Saturn. The trine and sextile are harmonious energies, so I believe that the insights we gain earlier in the day may contribute directly to the breakthrough I mentioned above. On Saturday, Venus enters Leo. It’s time to get your hair done and admire your gorgeous self. Practice sincere flattery. Stroke someone’s ego, and allow someone to adore you. 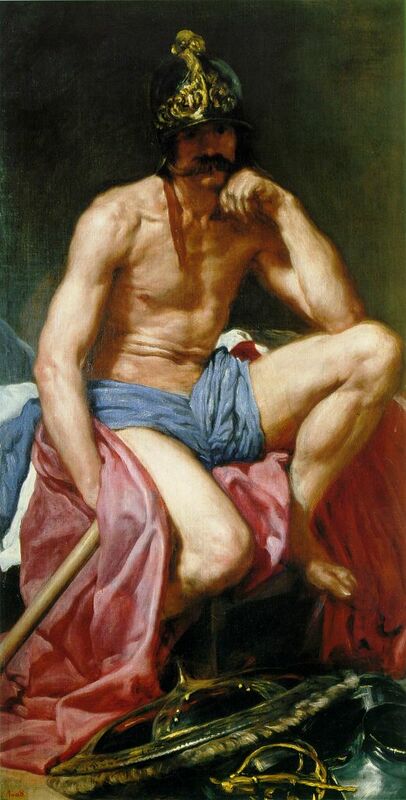 Image: Mars at Rest, by Diego Velazquez, c. 1640, Museo del Prado. This entry was posted in About astrology, Forecasts and tagged mars conjunct saturn, Venus in Leo, Virgo on July 6, 2008 by Pat. It’s funny you should mention 11. It seems like every time I look at the clock, it’s 11 minutes past the hour. Things in general feel like the proverbial eleventh hour. Looks like the two planets in question will meet in my 5th house Virgo. I have been creatively stuck for a long time now. I haven’t attempted to make one of my Ukrainian eggs since the last one broke. I’m not even interested in entering the State Fair competition, which is as well because you need a set of 3. Maybe something will come loose in this dept. soon and give me something to work with. Joe, it’s interesting that you mention creative projects. When Saturn was in my fifth house, I took up knitting. I learned as a child but never had the patience for it until Saturn toured my fifth house. I was so patient that I ripped out two whole sweaters and redid them because I didn’t like the way they fit. Once Saturn left my fifth house, I lost all interest in knitting. I’ve had a half-finished scarf in my knitting basket for two years. The Mars-Saturn conjunction can be powerful, but in my experience, only if it is triggering a sensitive point in the chart. The fact that the conjunction is in a common sign will likely lead to a here-and-there kind of energy, where matters will not get closure easily…things or issues you thought were gone would be back. Thanks for a great post and a fun blog! My Ascendant is at 4 Virgo, and as my twitters to Neith will attest, I’ve been feeling really frustrated. The last nine + months of Saturn passing over my Ascendant have correlated with a lot of hard work in building my blog/forum, and thankfully I’ve survived some serious hardships. With Mars in the picture, I’m feeling a tremendous impatience to have all my hard work manifest — right now. In addition, I have been feeling mucho frustrated when things don’t go my way. I’m not quite having a tantrum over it, but it’s been a challenge to be at peace with it all. Welcome to Real Astrologers, Nina! We love getting feedback from our peers because it all goes into our collective knowledge base. With Mars in the picture, I’m feeling a tremendous impatience to have all my hard work manifest — right now. We will all make it yet!